1. Aracena caves – the small sleepy white town of Aracena hides a marvelous treasure under its streets. It’s the Cave of Wonders, large network of limestone caverns connected by corridors. In each magical cavern you will find weird and wonderful stalagmites and stalactites forming most incredible patterns, a sheer wonder of nature. You can only explore the caves in a guided tour of 30 people max. It is prohibited to use camera one you enter the caves. 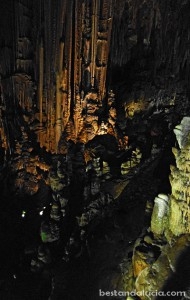 During 1,5 hour tour you will explore only 10% per cent of the caverns, but that is enough to leave you awestruck. Entrance fee for an adult: 8,5 Euros. 2. 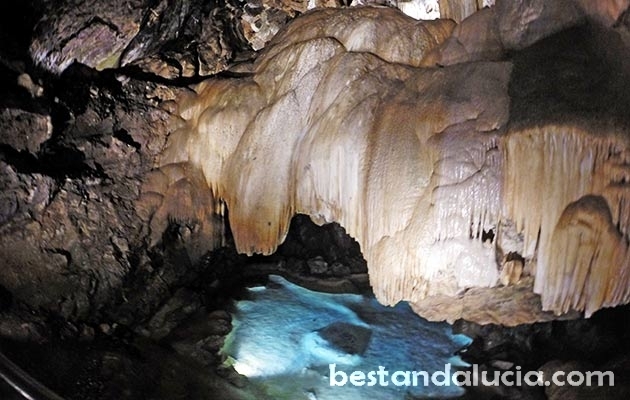 Nerja caves – Cuevas de Nerja are home to world’s largest stalagmite which is 32 meter long. The large caves are connected by steps going up and down in a circular route. It takes about 45 minutes to see all the caves on display. It is possible to visit the caves with and without a guide. In the summer time, the place can get crowdy. Entrance fee for an adult: 9 Euros. 3. Gibraltar caves – St. Michael’s Cave, one of the 150 caves in the Rock of Gibraltar, is an absolute must-see when you pay a visit to the British exclave on the southern Spanish coast. This impressive network of limestone caverns and chambers can be accessed from the Upper Rock Nature reserve. St. Michael’s Cave boasts long history of military use. Today, it is often used as a venue for music concerts, because it created a vibrant musical force. Entrance fee for an adult: 9 Euros. It is also possible to explore the Lower St. Michael’s cave which can be visited by appointment only and requires some bending, climbing and sliding to get from one chamber to another! 4. 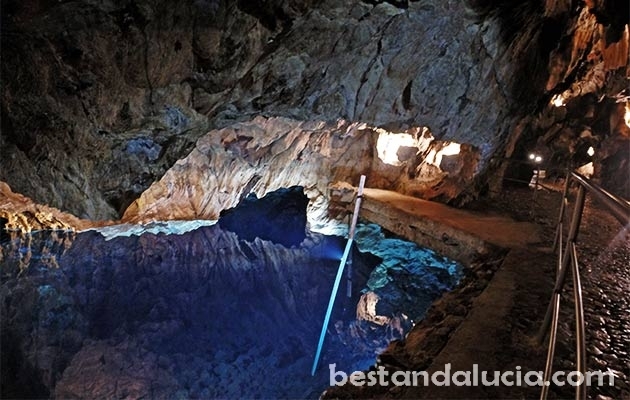 Pileta Cave, near the village of Benaoján, Sierra of Grazelema. Situated at 711 meters altitude in the south slope of a rocky hill. 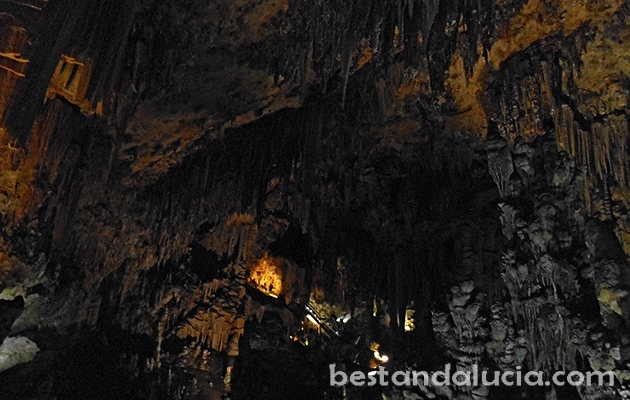 This prehistoric cave was declared National Monument by the Spanish state in 1924. Pileta Caves are most famous for the paintings that can be found in different chambers inside. Some of those galleries date back to 31,000 B.C. The paintings show various animals and some mysterious signs as well. Only guided tours are available. Remember to wear shoes that can provide traction as it can be slippery inside. A visit lasts ca. 1 hour. It is impossible to use cameras inside the cave. Entrance fee for an adult: 8 Euros. 5. Cave houses of Guadix – the small city at the foothills of Sierra Nevada is famous for troglodyte caves. Around 2000 of those cave dwellings are inhabited today by locals and form a district called “Barrio Troglodyte”! It is also possible to rent some of those houses. There is a Cave-Museum of Traditional Culture in Guadix as well. Cueva Museo is located in front of the church of San Miguel. From winter to autumn there is a steady 18-20°C temperature inside the Guadix cave houses. That means that the house owners don’t have to pay for air conditioning in summer and don’t need to pay for heating in winter. The size of a typical troglodyte house depends on the hill from which the house was carved out. Houses usually face to the south allowing for most sun exposure throughut the day. The rooms closest to the entrance are those that need warmth and light most: the kitchen and the living room. Further behind there are bedrooms and bathroom. At the very end, different storage rooms are set up. 6. 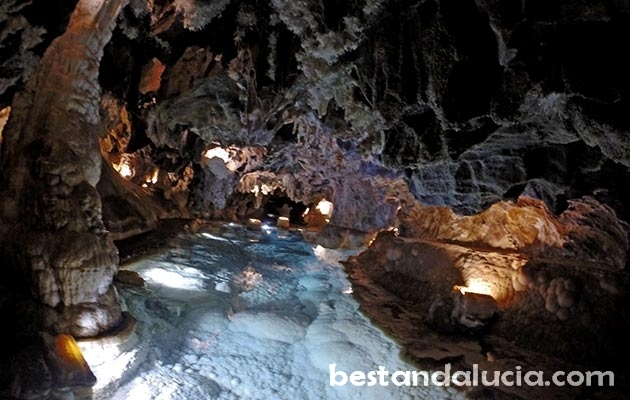 Sorbas caves – located massive underground world which comprises of more than one thousand gypsum caverns connected by different corridors. The entrance to the cave sis located only 2 kms from Sorbas (near Almeria) in the Karst en Yesos de Sorbas Park. There are four routes for beginners are for experts. The easiest route can be completed in 2 hours. Even the Ruta Basica requires some basic physical fitness as it involves some climbing, squeezing and crawling. The most diificult route can take 4,5 h to complete. Not recommended for individuals with cluastrohopbia! Entrance fee for an adult: 15 – 50 Euros depending on which route you decide to take.